Two violin virtuosos juxtaposing each other, two pinnacles of baroque solo violin literature. 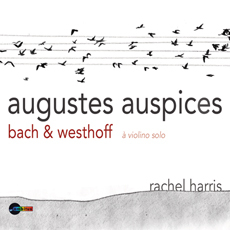 The CD »augustes auspices« tells the fascinating story of how they came to be written and poses the question: what if young Bach had not met the elder Westhoff in Weimar? Is it Westhoff we need to thank, that Bach wrote his Sonatas and Partitas? Westhoff’s technically highly challenging suites for solo violin probably played an important musical role for the young, 18 year old Bach, at that time engaged to play the violin and viola in the “Rotes Schloß” in Weimar. Likewise, the close vicinity of Bach’s place of work and Westhoff’s house strongly suggests that these two summiteers of music for solo violin must have met. Bach left after only a few months, but returned in 1708 to live in what had been Westhoff’s house and is now known as the house of J.S. Bach. Is this then the place where the first seeds of Bach’s Sonatas and Partitas was sown? Westhoff was certainly the last representative of the 17th century north German violin school that Bach was to meet. And what historical-political aspect is concealed behind the word play »augustes auspices«, which can mean “imperial harbinger” as well as “regal protection”? Rachel Harris “audibly” illuminates all aspects with her polished tone, immediate and highly virtuosic playing, giving chromatic movements a wonderful spice, interpreting both composers' orchestral writing on one instrument exceptionally strongly. Both collections to be heard together for the first time on 3 CDs.